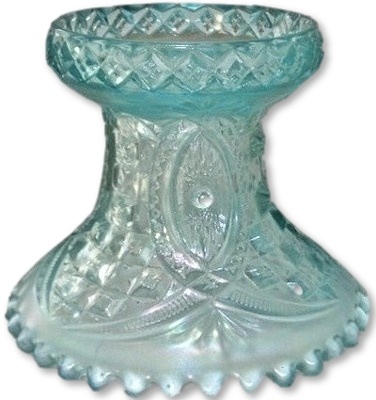 The original Northwood glass company was founded by Harry Northwood in 1887 in Martins ferry, Ohio, and was moved to Ellwood City, Pennsylvania. But the company did not prosper in that location. 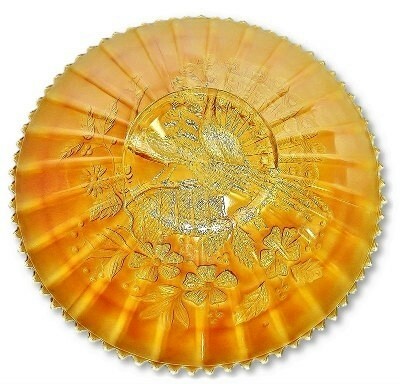 In 1895 he opened up the New Northwood glass company in a factory previously owned by the Indiana Glass company in Indiana, Pennsylvania. 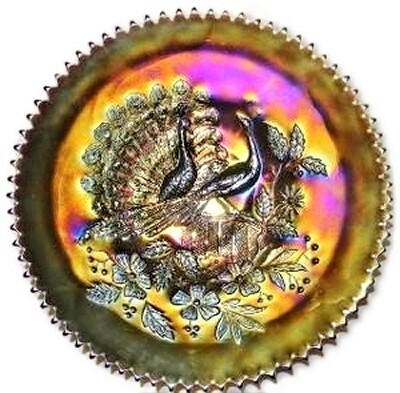 This factory joined National glass conglomerate in 1899. 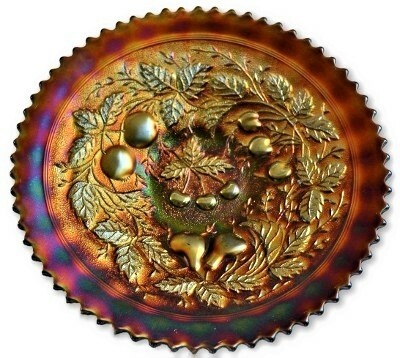 In 1902 Harry opened the Harry Northwood and company factory in Wheeling, West Virginia. The factory had belonged to the J. H. Hobbs, Brockunier and Company. 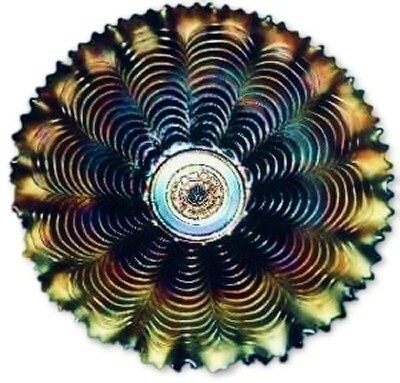 It was here that he developed his formula for Carnival glass. Harry Northwood died in 1919. 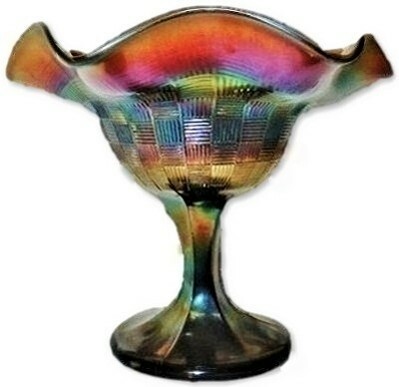 The company continued producing glass, but was closed in 1925. 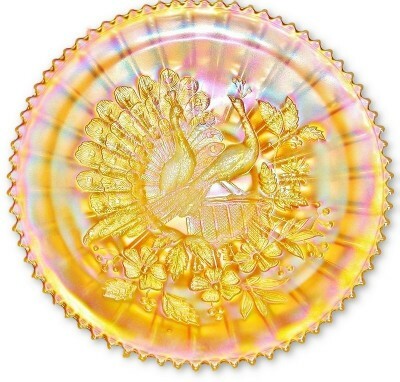 The items offered for sale on this page are Carnival Glass from the "classic era" circa 1907-1930 unless otherwise noted. 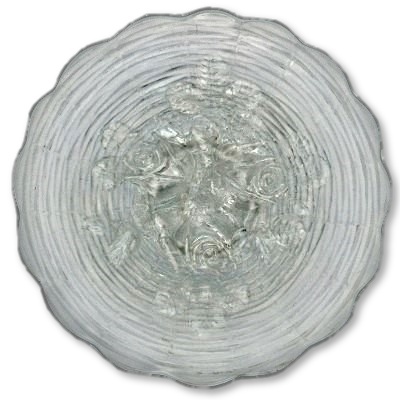 As such, the items may have normal anomalies present, such as straw marks, tool marks, slight spotting from the making in the finish, normal use shelf wear, small interior glass bubbles which are not broken or very slight seam or edge wear roughness to the touch which would not be considered as flakes nor fleabites. 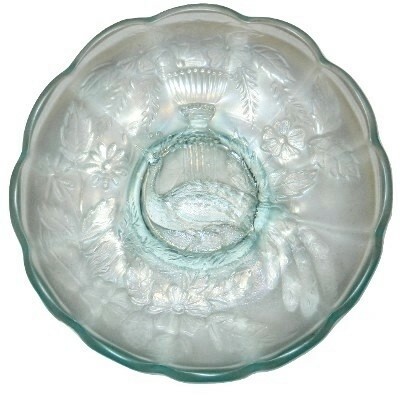 Ice blue HEARTS AND FLOWERS ruffled bowl. Measuring 9" X 2 1/2". No chips, cracks or repairs. Frosty white Hearts and Flowers compote. Measuring 6 3/4" X 6". No chips, cracks or repairs. 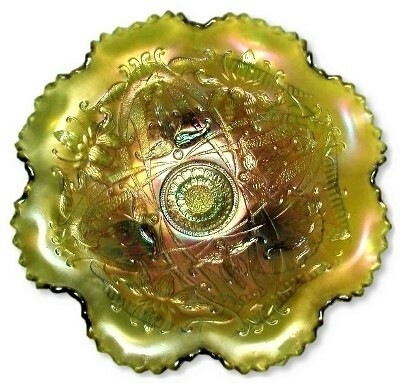 Green Leaf and Beads 3 twig footed deep plate! 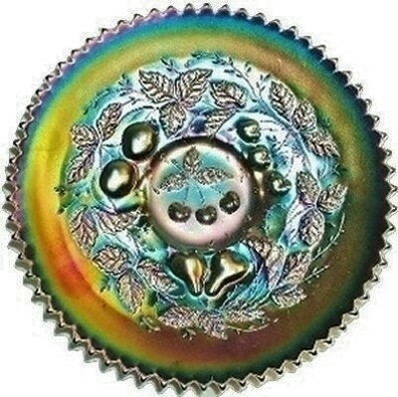 There is only minor wear to the very center of the iridescent finish and only seen when held to strong light. Marked with NORTHWOOD'S underlined capital N in a circle. Measuring 8 1/2" across and sitting 2 1/2" high. No chips, cracks or repairs. 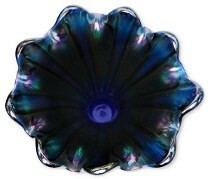 Purple LUSTRE FLUTE ruffled hat vase. Measures 5" X 3 1/4". There is one extremely tiny pin prick on the rim and a few minor wear marks. No chips, cracks or repairs. 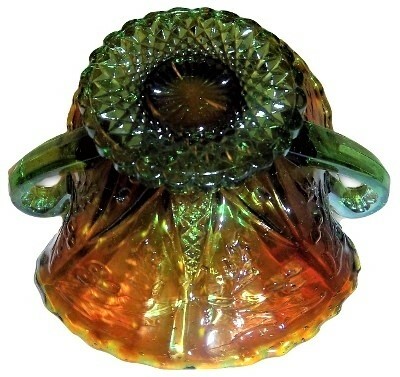 Alaskan green LUSTRE FLUTE low handled nappy, whimsies from the punch cup. 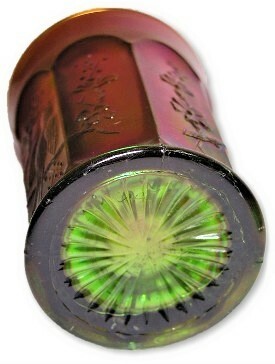 Measures 5 3/8" X 2 1/8" Slightly reactive to black light. Marked with NORTHWOOD'S underlined capital N in a circle. No chips, cracks or repairs. 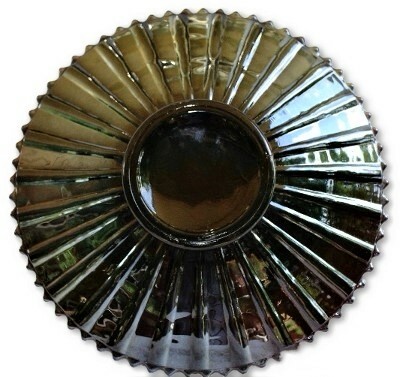 Green "MEMPHIS" pattern, punch bowl or fruit bowl stand. 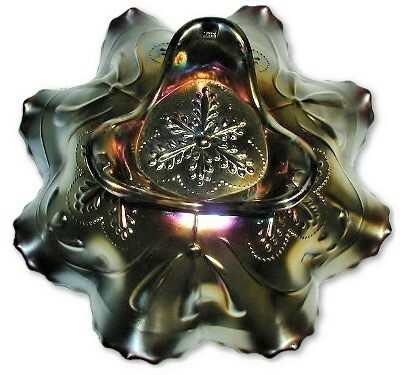 This base fits either of the large bowls, the punch bowl collar fits inside the punch base while the fruit bowl fits outside the collar. Measures 5 1/4" X 6" X 4 1/4". Marked with Northwood's underlined capital N in a Circle. No chips, cracks or repairs. 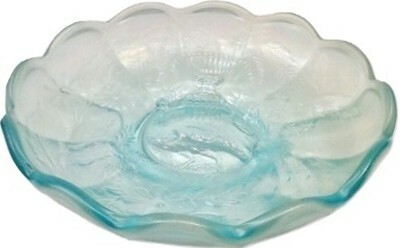 Ice blue "MEMPHIS" pattern, punch bowl or fruit bowl stand. 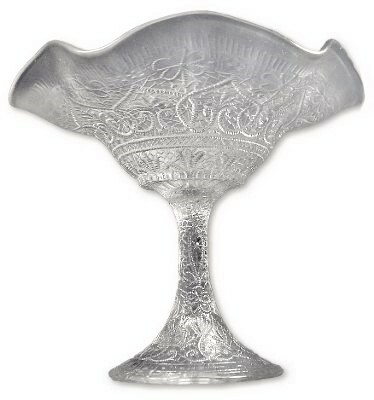 This base fits either of the large bowls, the punch bowl collar fits inside the punch base while the fruit bowl fits outside the collar. Measures 5 1/4" X 6" X 4 1/4". Marked with Northwood's underlined capital N in a Circle. There is a small in the making bit of sand like pebble included inside the glass with two of the tiniest reflections on each side of this. It measures less than 1/8" total and is not damage. No chips, cracks or repairs. 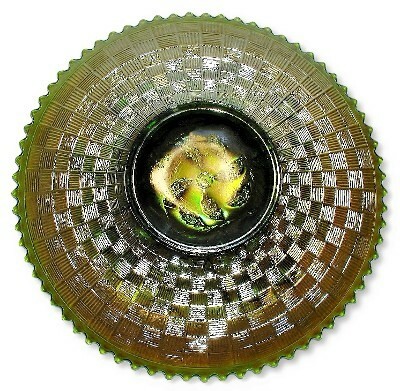 Lime Ice Green "MEMPHIS" pattern, punch bowl or fruit bowl stand. 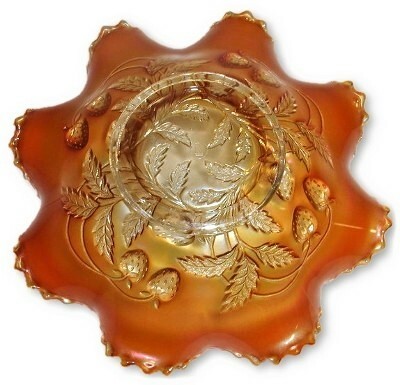 This base fits either of the large bowls, the punch bowl collar fits inside the punch base while the fruit bowl fits outside the collar. Measures 5 1/4" X 6" X 4 1/4". Marked with Northwood's underlined capital N in a Circle. A few extremely tiny flea bite flakes along the seam edge which we believe to be from the manufacturing process. No chips, cracks or repairs. 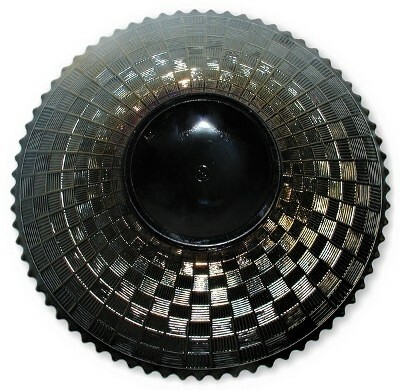 Dark purple to almost black amethyst "MEMPHIS" pattern, punch bowl or fruit bowl stand. 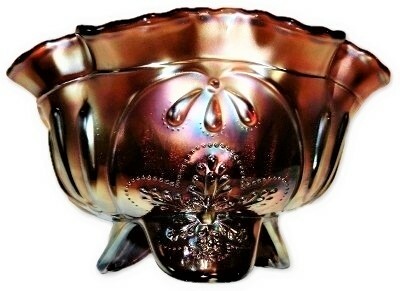 This base fits either of the large bowls, the punch bowl collar fits inside the punch base while the fruit bowl fits outside the collar. Measures 5 1/4" X 6" X 4 1/4". Marked with Northwood's underlined capital N in a Circle. No chips, cracks or repairs. 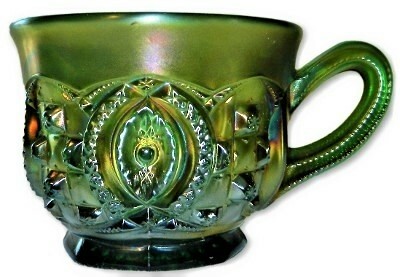 Green "MEMPHIS" pattern, punch cup. Measures 2 1/2" X 3 1/2" X 4 1/2". Marked with Northwood's underlined capital N in a Circle. No chips, cracks or repairs. 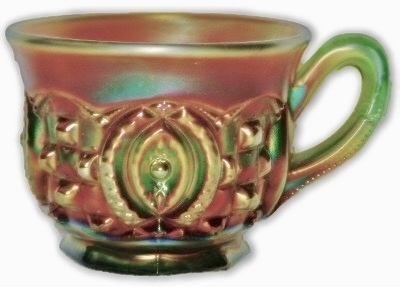 Green with rich butterscotch iridescent finish "MEMPHIS" pattern punch cup. Measures 2 1/2" X 3 1/2" X 4 1/2". Marked with Northwood's underlined capital N in a Circle. Some no harm dark speckles inside the cup. No chips, cracks or repairs. 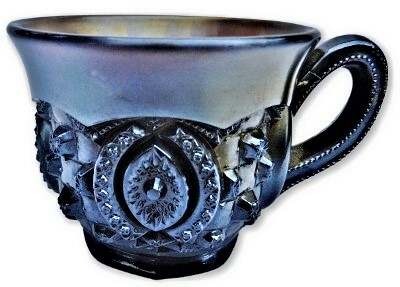 Purple to almost black amethyst "MEMPHIS" pattern punch cup. Measures 2 1/2" X 3 1/2" X 4 1/2". Marked with Northwood's underlined capital N in a Circle. No chips, cracks or repairs. 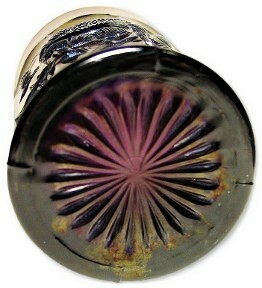 Purple "MEMPHIS" pattern punch cup. Measures 2 1/2" X 3 1/2" X 4 1/2". Marked with Northwood's underlined capital N in a Circle. No chips, cracks or repairs. 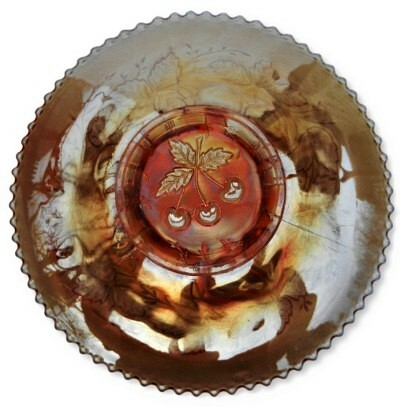 Oxblood NIPPON pie crust edge bowl. Measures 8 3/4" X 2 1/4". No chips, cracks or repairs. 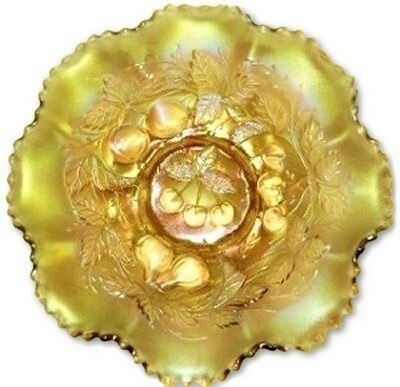 White pie crust edge NIPPON bowl. 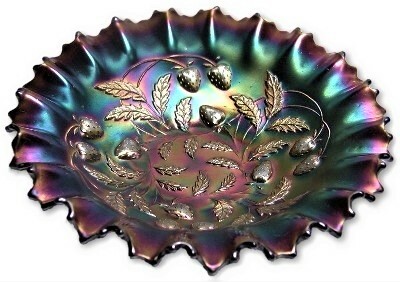 This example has an excellent mold strike and outstanding frosty iridescent finish. 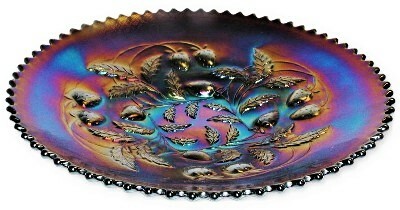 Measures 9" X 2 1/8". No chips, cracks or repairs. 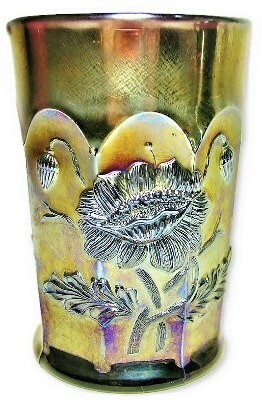 Amethyst ORIENTAL POPPY TUMBLER! Marked with Northwood's underlined capital N in a circle. Measures 4 1/4" X 3 1/4" across the top. No chips, cracks or repairs. 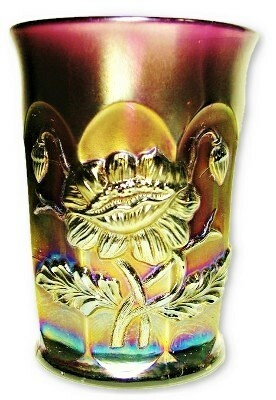 Fiery amethyst ORIENTAL POPPY TUMBLER! Marked with Northwood's underlined capital N in a circle. Measures 4 1/4" X 3 1/4" across the top. No chips, cracks or repairs. 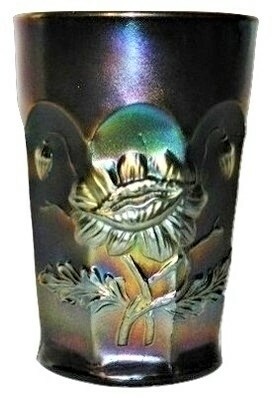 Black amethyst ORIENTAL POPPY TUMBLER! 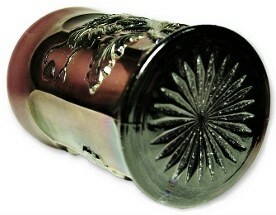 Covered in a stunning satin black iridescent finish. Marked with Northwood's underlined capital N in a circle. Measures 4 1/4" X 3" across the top. There is a small bump of extra glass on the bottom rim where the seam line meets. No chips, cracks or repairs. 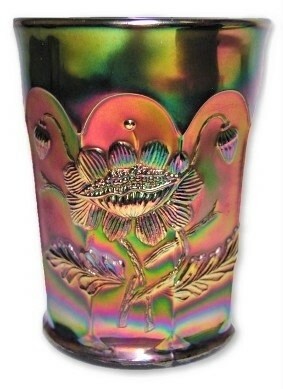 Green ORIENTAL POPPY TUMBLER! Marked with Northwood's underlined capital N in a circle. Measures 4 1/4" X 3" across the top. There is one extremely tiny scratch like flea bite on the top rim. Other than the minuscule scratch there are no chips, cracks or repairs. 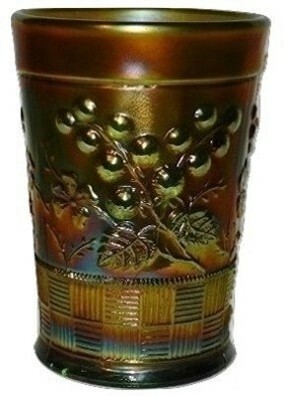 Green ORIENTAL POPPY tumbler. Marked with Northwood's underlined capital N in a circle.Measures 4 1/4" tall and 3" across the top. No chips, cracks or repairs. 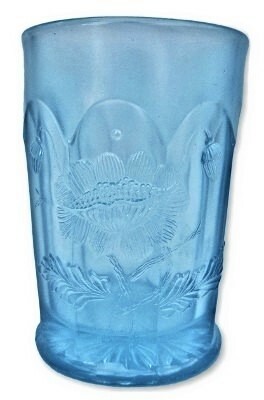 Ice blue ORIENTAL POPPY tumbler. Measures 4" tall and 3". Marked with Northwood's underlined capital N in a Circle. No chips, cracks or repairs. 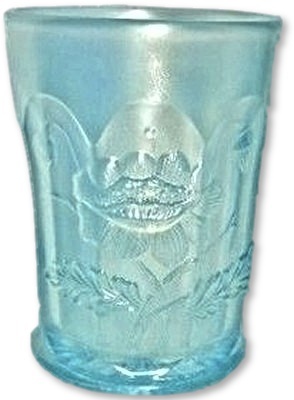 ORIENTAL POPPY Sapphire blue tumbler. Measures 4" tall and 3". Marked with Northwood's underlined capital N in a circle. 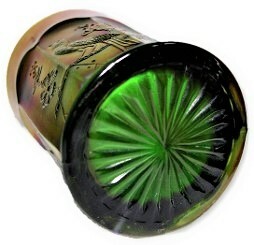 This tumbler glows bright green under UV/black light. No chips, cracks or repairs. 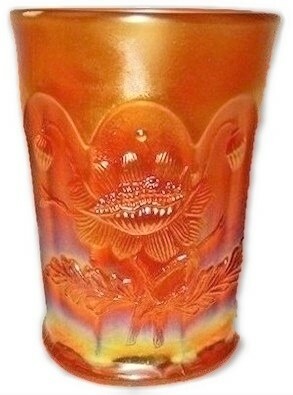 Marigold Oriental Poppy tumbler. Measuring 4" tall and 3". No chips, cracks or repairs. 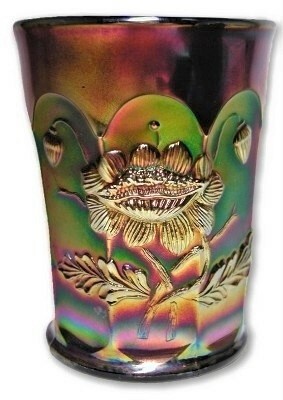 Purple Oriental Poppy tumbler. Measuring 4" tall and 3" across the top. No chips, cracks or repairs. 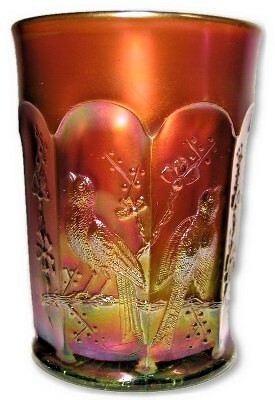 Purple Oriental Poppy tumbler. Measuring 4" tall and 3". No chips, cracks or repairs. 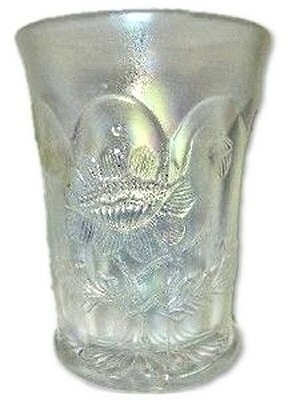 Frosty white Oriental Poppy tumbler. Measuring 4" tall and 3". No chips, cracks or repairs. 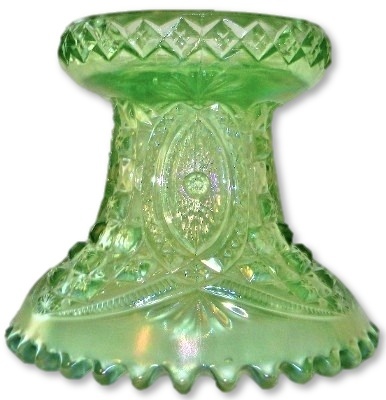 PANELED HOLLY Green radium handled pedestal compote. Marked with NORTHWOOD'S underlined capital N in a circle. Measures 7 1/2" X 7" X 3 1/2". No chips, cracks or repairs. 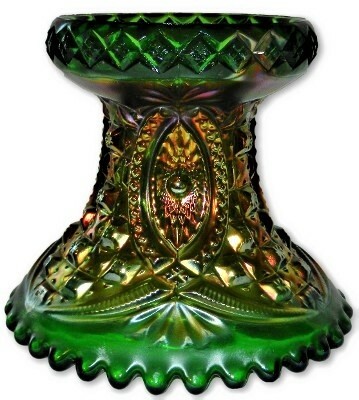 PANELED HOLLY Alaskan Green handled pedestal compote. Marked with NORTHWOOD'S underlined capital N in a circle. Measures 6 1/2" X 6" X 4". No chips, cracks or repairs. 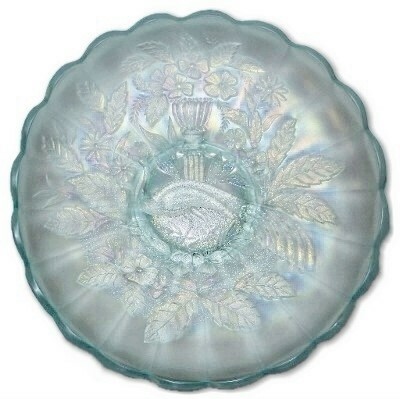 Northwood PEACOCK AND URN Amethyst small ice cream shape bowl. Measuring 5 5/8" across and sitting 1 1/2" high. Marked on the base with Northwood's underlined capital N in a circle. No chips, cracks or repairs. 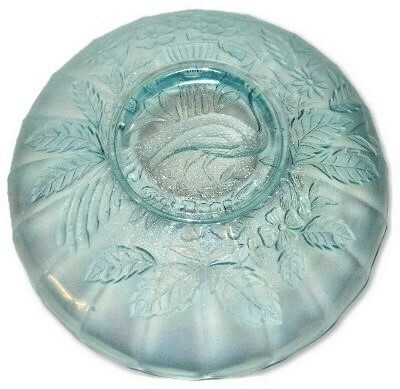 Ice blue PEACOCK AND URN small ice cream shape bowl. Measuring 5 5/8" across and sitting 1 1/2" high. 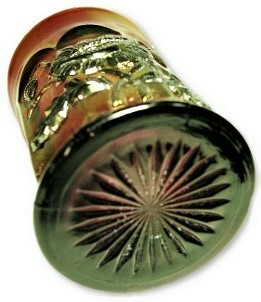 One of the two available has some fine black marks on the seam edge of the Marie from the mold. Marked on the base with Northwood's underlined capital N in a circle. No chips, cracks or repairs. 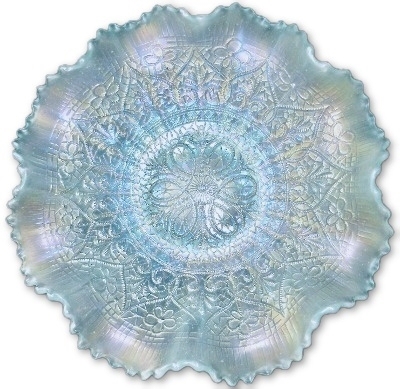 Ice blue PEACOCK AND URN 10"master ice cream shape bowl. Measuring 10" across and sitting 2 1/4" high. There is a very minor in the making tool mark on the edge of the bowl. Marked on the base with Northwood's underlined capital N in a circle. No chips, cracks or repairs. 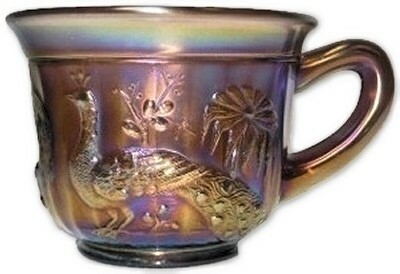 Amethyst Peacock at the Fountain punch cup. Marked with NORTHWOOD'S underlined capital N in a circle. 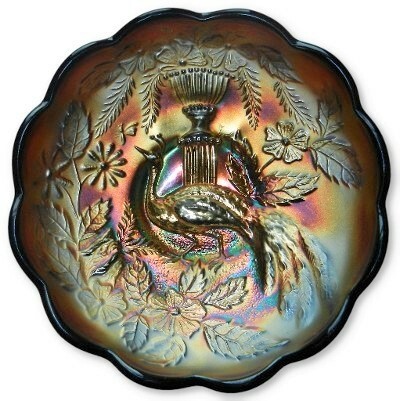 Measures 2 1/2" high and 4" across from top rim to outside of handle. No chips, cracks or repairs. 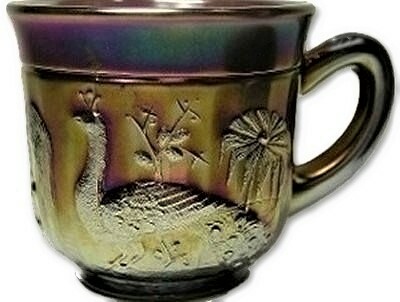 Lavender Peacock at the Fountain punch cup. Marked with NORTHWOOD'S underlined capital N in a circle. Measures 2 1/2" high and 4" across from top rim to outside of handle. No chips, cracks or repairs. 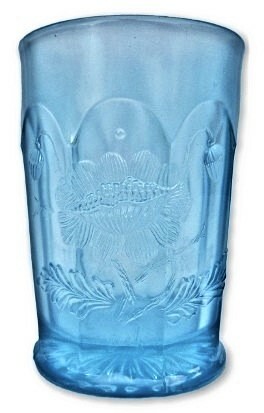 Ice blue PEACOCK AT THE FOUNTAIN tumbler. Measures 4" tall and 3". Marked with Northwood's underlined capital N in a circle. No chips, cracks or repairs. 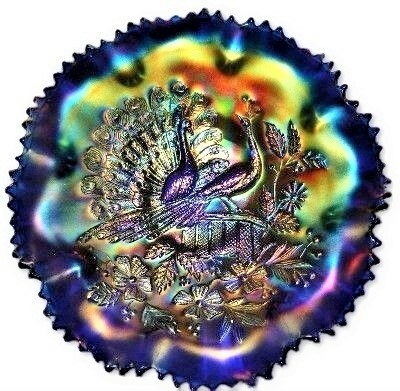 Electric blue Northwood Peacock on the Fence ruffled bowl. Measures 9" X 2 1/4". The ruffled edge has some in the making webbing between the saw tooth edges and there are two points that appear to have been partially flaked away. This is a beautiful example. No other cracks or repairs. 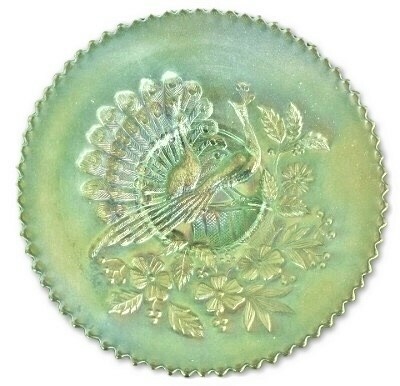 Lime ice green plain back PEACOCK on the FENCE plate. Measures 9" X 1 1/2". No chips, cracks or repairs. Dark purple rib back PEACOCK on the FENCE deep plate. Measures 9" X 1 1/2". 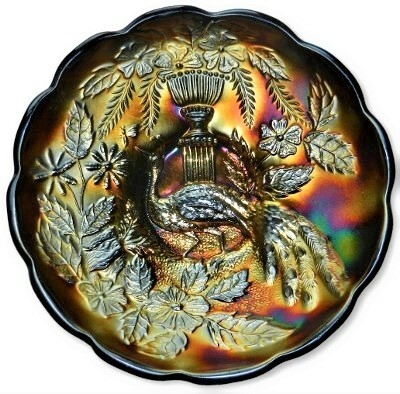 There is minor use or stacking wear to the back of the plate. No chips, cracks or repairs. 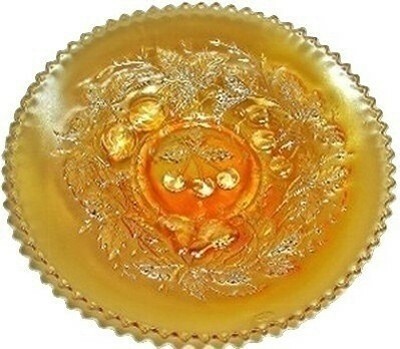 POPPY SHOW Marigold Bowl! 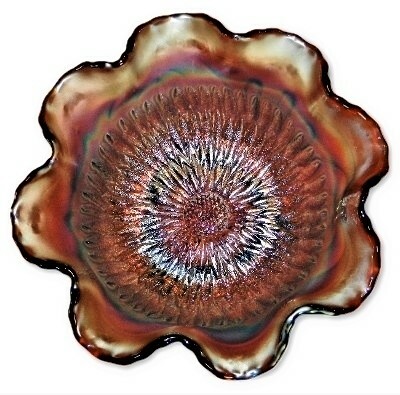 This item measures 9" across and sits 2 7/8" high. Some in the making anomalies such as minor straw marks, minor edge separation marks from tooling the rim and the cooling process. No chips, cracks or repairs. 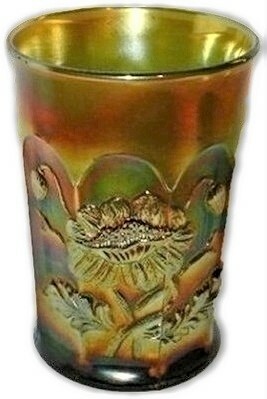 Green "RASPBERRY" tumbler. Marked with Northwood's underlined capital N in a circle. Measuring 4" tall and 3". No chips, cracks or repairs. 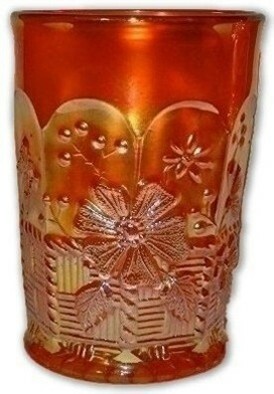 Marigold Raspberry tumbler. Marked with Northwood's underlined capital N in a circle. Measuring 4" tall and 3". No chips, cracks or repairs. 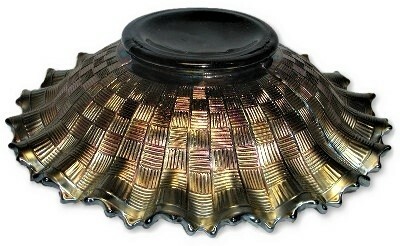 RAINBOW pattern with BASKET WEAVE exterior purple compote. 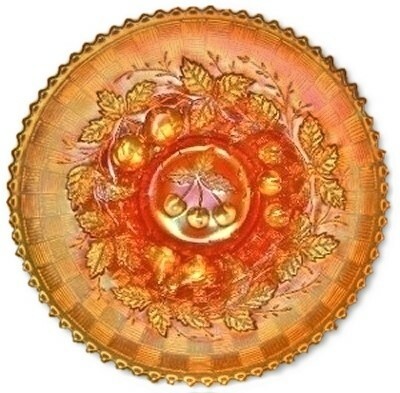 Measures 7" across and stands 5 1/2" high. The Northwood underlined capital N is located inside the compote. No chips, cracks or repairs. 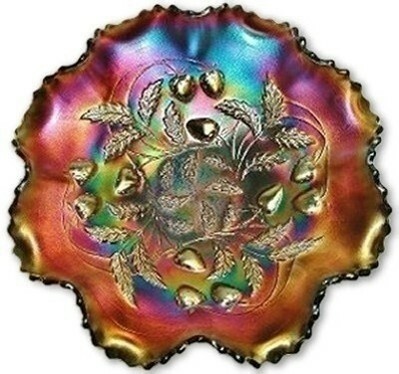 Amethyst RAINBOW pattern, basket weave back pattern plate. 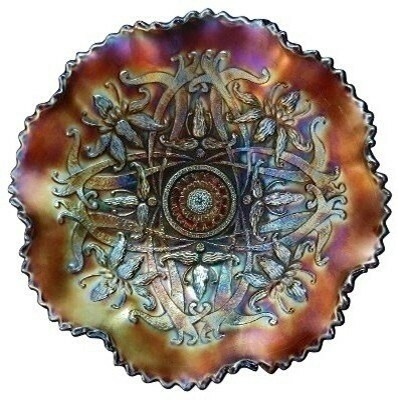 Measures 9" across and sits 1 1/2" high. Marked with Northwood's underlined capital N in a circle. A few minor scratches to the iridescent finish. No chips, cracks or repairs. 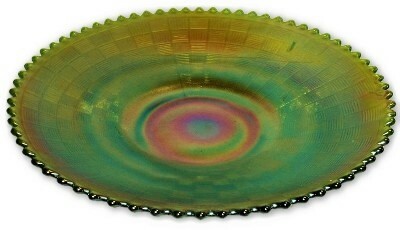 Apple green RAINBOW pattern, basket weave back pattern plate. Measures 9" across and sits 1 3/4" high. In the making indentation, some darker green color thread. Faintly marked with Northwood's underlined capital N in a circle. No chips, cracks or repairs. 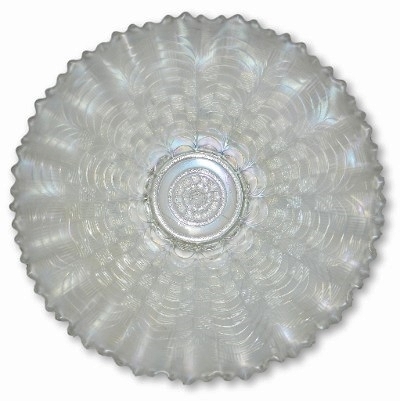 Northwood "Rose Show" white deep plate. Measures 9" X 2". No chips, cracks or repairs. 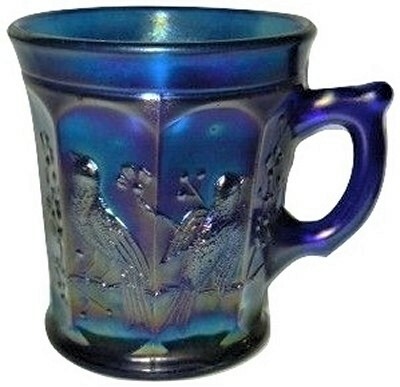 Amethyst Singing Bird mug. 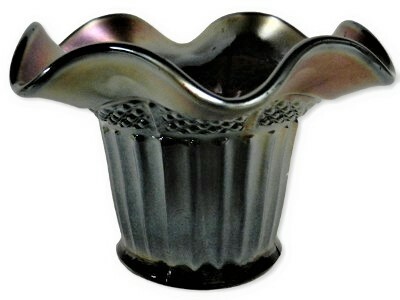 Measures 4" at the widest to tip of handle and stands 3 1/2" high. Marked with Northwood underlined capital N in a circle. No chips, cracks or repairs. 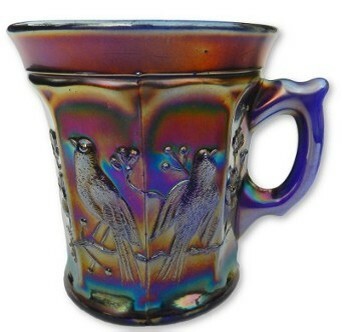 Amethyst Singing Bird mug. Measures 4" at the widest to tip of handle and stands 3 1/2" high. 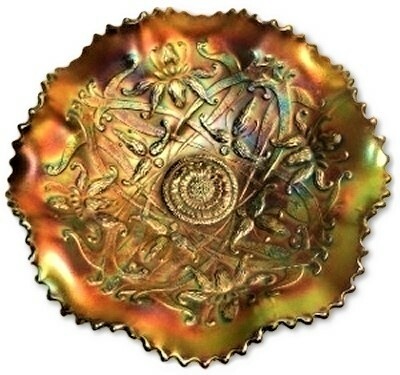 There are some light age use wear spots to the exterior and interior. Marked with Northwood underlined capital N in a circle. No chips, cracks or repairs. 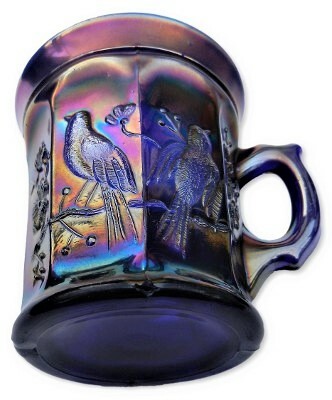 Black amethyst Singing Bird mug. Measures 4" at the widest to tip of handle and stands 3 1/2" high. Marked with Northwood's underlined capital N in a circle. 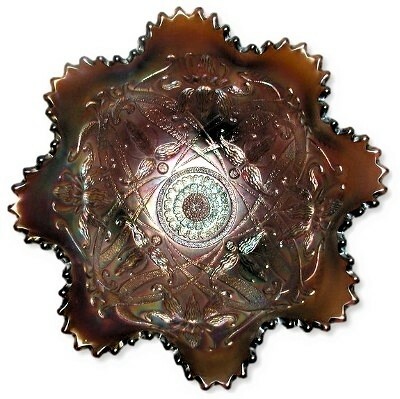 The base edge has a dip where the molten glass did not fully fill the shape of the mold. No chips, cracks or repairs. 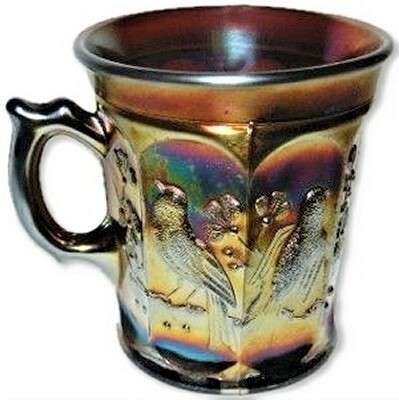 Wonderful b;ie Singing Bird mug. Measures 4" at the widest to tip of handle and stands 3 1/2" high. Marked with Northwood's underlined capital N in a circle.No chips, cracks or repairs. 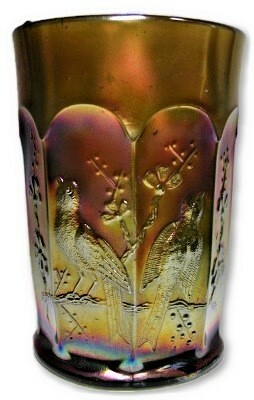 Green Singing Bird tumbler. Measures 4" tall and 3" across the top. There is a small in the making manufacturer flaw at the rim. No chips, cracks or repairs. 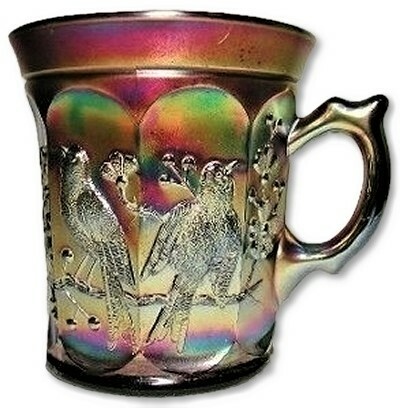 Green Singing Birds tumbler. 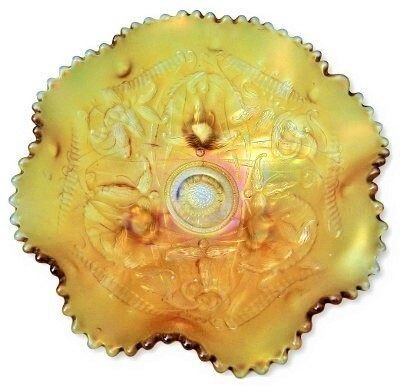 Stands 4 1/2" tall, 3" across the top and 2 1/2" across the base. 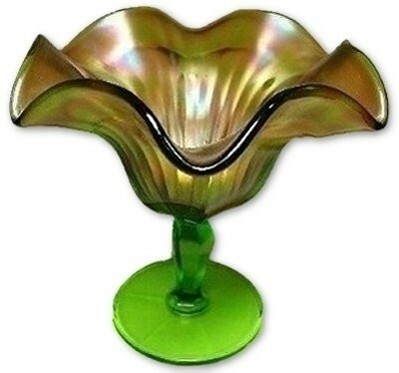 The top rim has a small bump extra glass that is completely covered with original iridescent finish. No chips, cracks or repairs. 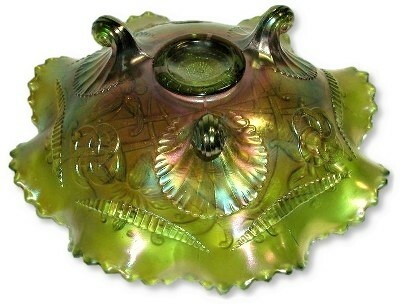 Green Smooth Rays stemmed compote. This item is marked with NORTHWOOD'S underlined capital N in a circle. Measures 5 1/2" high and 5 1/2" across at the widest point. No chips, cracks or repairs. 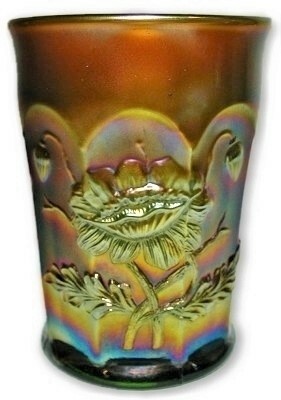 Dark marigold "SPRINGTIME" tumbler. Marked with Northwood's underlined capital N in a circle. Measuring 4" tall and 3". No chips, cracks or repairs. 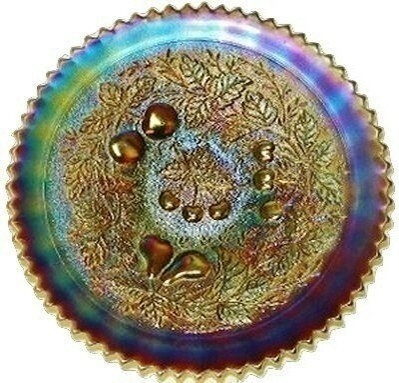 Electric fiery amethyst Strawberry pie crust edge bowl. Has the basket weave back pattern and a faint Northwood underlined capital N in a circle mark. Measures 9" X 2 1/2". No chips, cracks or repairs. 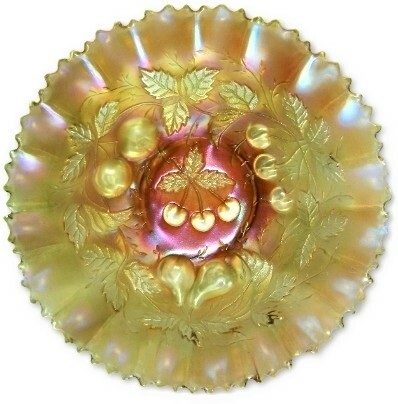 Brillaint fiery amethyst STRAWBERRY with plain back ruffled bowl. Measures 8 3/4" X 2 1/2". Marked with NORTHWOOD'S underlined capital N in a circle. No chips, cracks or repairs. 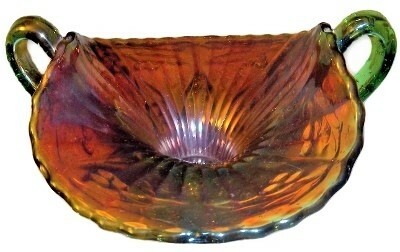 Fiery amethyst STRAWBERRY with basket weave ruffled bowl. Measures 8 1/2" X 2 1/2". Marked faintly with NORTHWOOD'S underlined capital N in a circle. No chips, cracks or repairs. 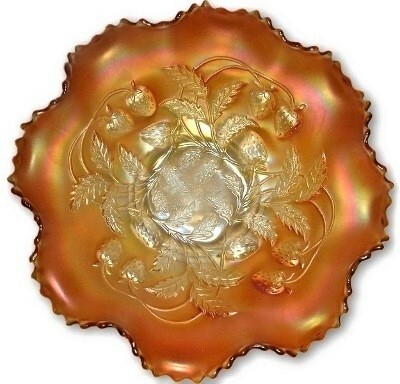 Marigold Strawberry pattern plain back ruffled edge bowl. Marked with Northwood's underlined capital N in a circle. Measures 9" X 2 1/2". No chips, cracks or repairs. 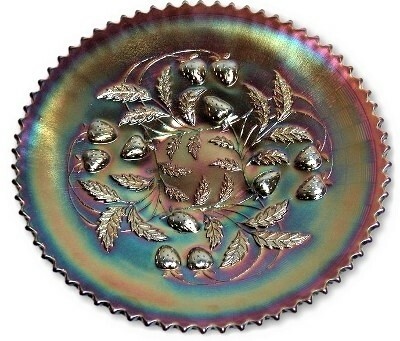 Brilliant amethyst Strawberry plate with basket weave back pattern. Marked with Northwood's underlined capital N in a circle, Measuring at 9" across and standing 1 1/4". No chips, cracks or repairs. 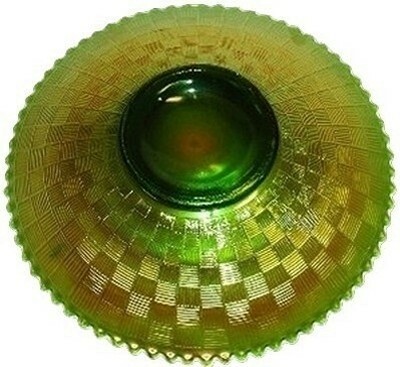 Green Strawberry with basket weave back pattern plate. Measures 9" X 1 3/4". Marked with Northwood's underlined capital N in a circle. No chips, cracks or repairs. 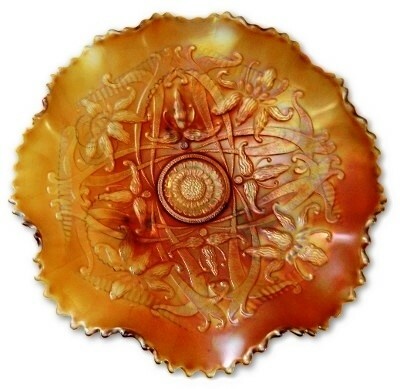 Marigold Strawberry and basket weave back pattern plate. Marked with NORTHWOOD's underlined capital N in a circle. Measures 9 1/4" X 1 3/4". No chips, cracks or repairs. 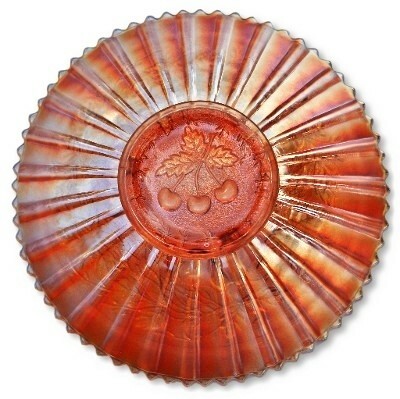 Pink/marigold plain back STRAWBERRY plate. Measures 8 3/4" across and sits 1 7/8" high. No chips, cracks or repairs. 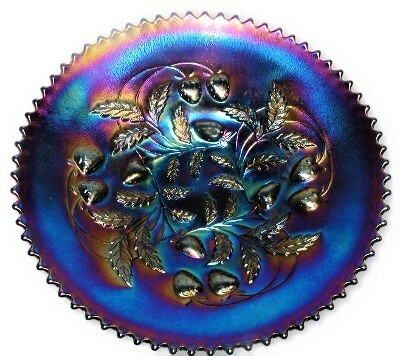 Electric purple Strawberry plate with basket weave back pattern. Marked with Northwood's underlined capital N in a circle, Measuring at 9" across and standing 1 3/4". No chips, cracks or repairs. 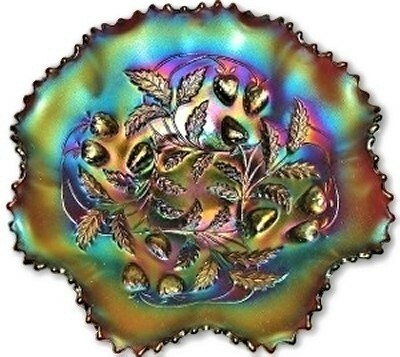 Lavender & root beer SUNFLOWER with MEANDER back pattern 3 spatula foot ruffled nut bowl. Measures 7 1/4" X 3 7/8". No chips, cracks or repairs. 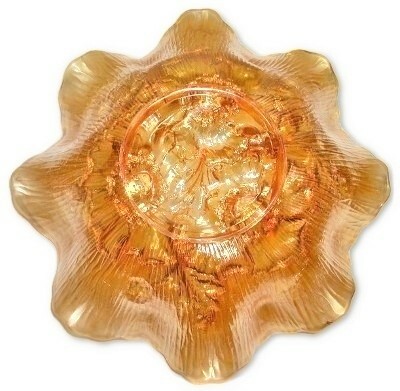 Lavender & root beer SUNFLOWER with MEANDER back pattern 3 spatula foot ruffled nut bowl. Measures 7 3/4" X 3 3/4". No chips, cracks or repairs. 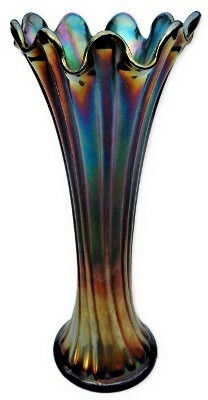 Brilliant blue NORTHWOOD "Thin Rib" standard vase. Measures 10 1/2" X 3 1/2" base. Marked with Northwoods underlined capital N in a circle. No chips, cracks or repairs. 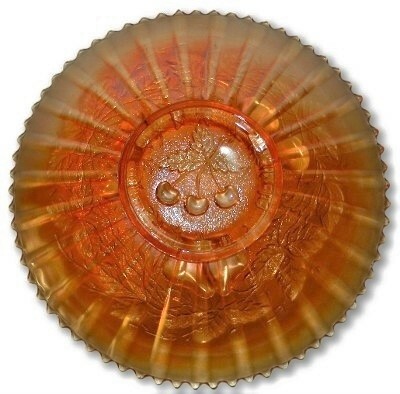 Rare, ginger ale THREE FRUITS plain back bowl. 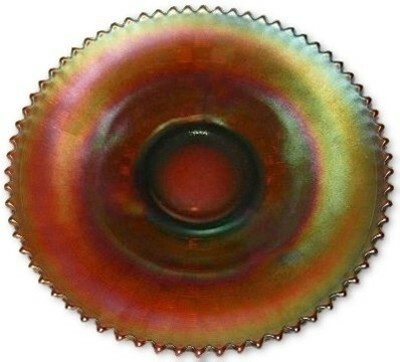 This example has one of the most elusive base glass colors made by NORTHWOOD. 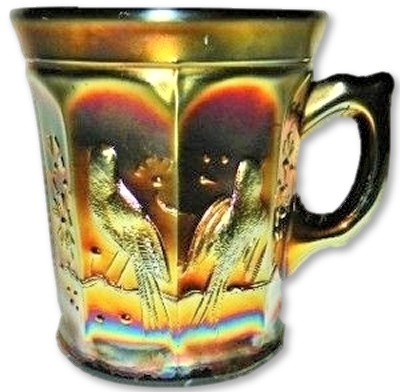 The glass is a smokey ginger ale and is covered with an electric pastel iridescent finish. Measures 8 3/4" X 2 1/2". This is one of the cleanest examples you could wish to find in this shape and color. Marked with NORTHWOOD'S underlined capital N in a circle. No chips, cracks or repairs. 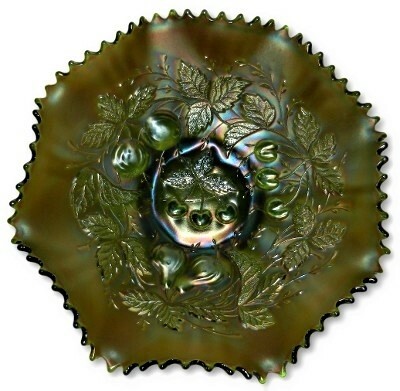 Northwood "THREE FRUITS" pattern green ruffled edge, plain back bowl. Marked with Northwood's underlined capital N in a circle. Excellent dark and rich color. Measures 9" X 2 1/4". No chips, cracks or repairs. 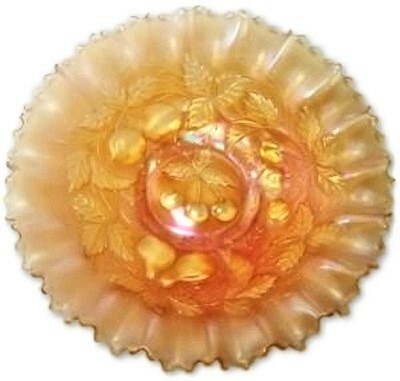 Pastel marigold on clear glass Three Fruits plain back ruffled bowl. Marked with Northwood's underlined capital N in a circle. Measures 8 1/2" X 2 1/2". A light amount of normal wear to the raised areas. No chips, cracks or repairs. 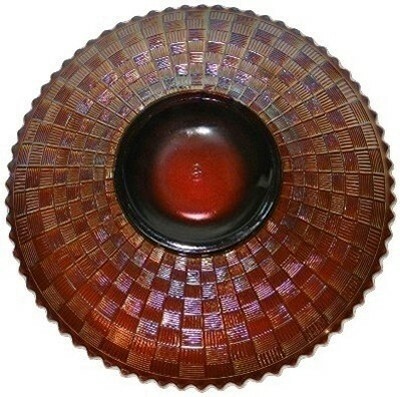 Fiery amethyst THREE FRUITS plate with basket weave back pattern. 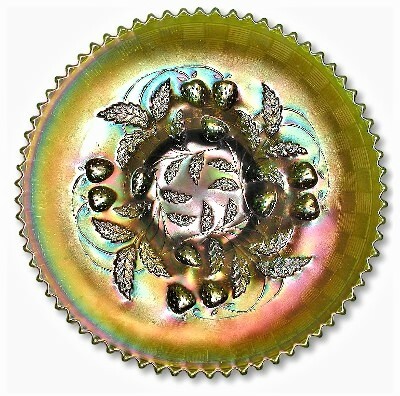 This deep plate has beautiful, color, and rich rainbow effect iridescent finish. 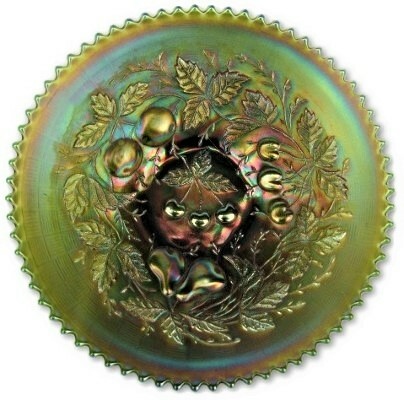 Light wear to the high points of the fruit as is commonly found on this pattern. Marked with NORTHWOOD'S underlined capital N in a circle. Measures 9 1/2" across and sits 1 3/4" high. 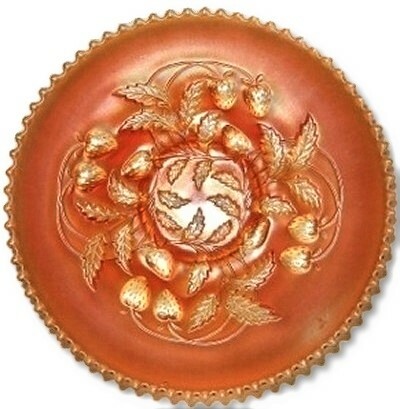 The plate is slightly uneven when sitting on a flat surface but it is not severe. No chips, cracks or repairs. 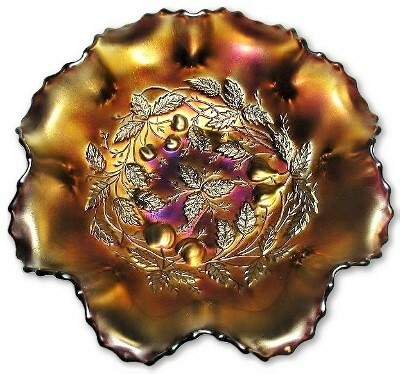 Amethyst Three Fruits with basket weave back pattern plate. This example has the tiniest bits of wear. Measures 8 3/4" X 1 3/4". Marked with NORTHWOOD's underlined capital N in a circle. No chips, cracks or repairs. 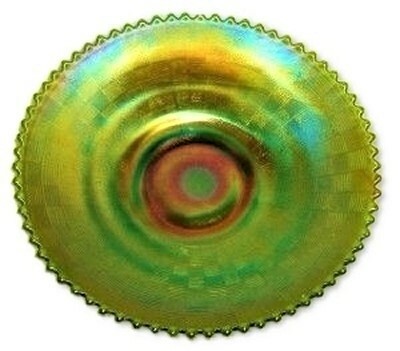 Green Three Fruits with basket weave back pattern plate. Measures 9" across and sits 1 1/2" high. No chips, cracks or repairs. 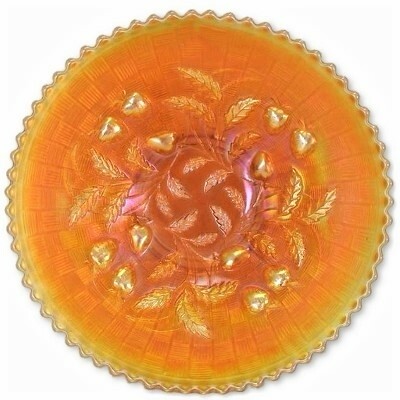 Marigold Three Fruit with basket weave back pattern plate. Marked with NORTHWOOD's underlined capital N in a circle. Measures 9" X 1 3/4". No chips, cracks or repairs. 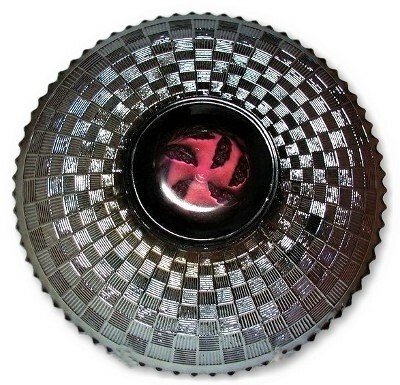 Rich purple Three Fruits with basket weave reverse pattern deep plate. 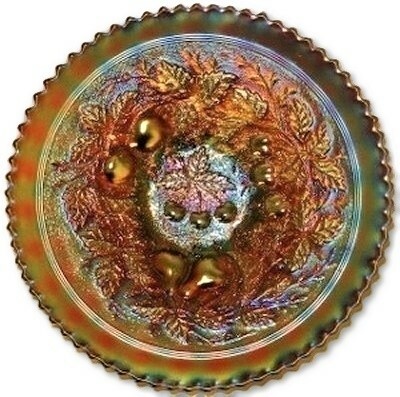 As is common for this pattern, there is some very light wear to the high points of the pattern. Measures 8 3/4" X 1 3/4". Marked with NORTHWOOD's underlined capital N in a circle. No chips, cracks or repairs. 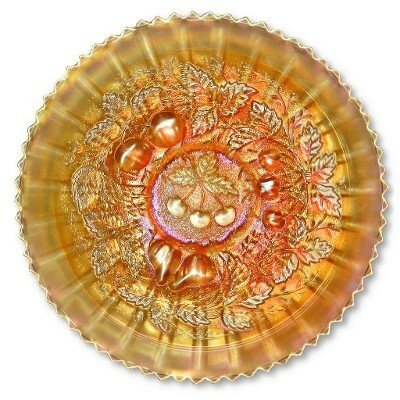 Pastel marigold plain back Three Fruit Plate. Measures 9" X 1 1/2". Marked with NORTHWOOD's underlined capital N in a circle. 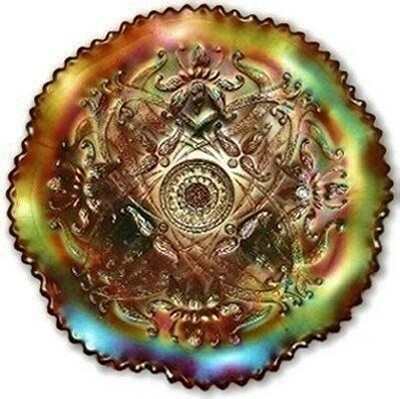 There is a closed bubble that can be seen in the image at about the 5:00 position. No chips, cracks or repairs. 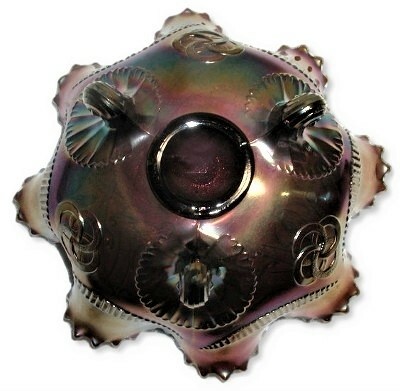 Dark fiery amethyst Northwood stippled THREE FRUITS with wide rib back pattern deep plate. Measures 9" across and sits 1 1/2" high. There is only minimal wear to the high points of the fruit. No chips, cracks or repairs. 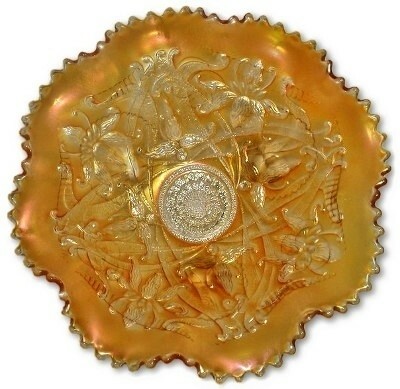 Marigold stippled THREE FRUITS with wide rib back pattern deep plate. Measures 9" across and sits 1 1/2" high. There is only very light wear to the high points of the fruit. No chips, cracks or repairs. 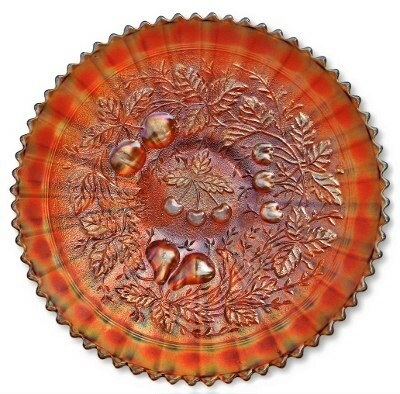 Pumpkin stippled THREE FRUITS with wide rib back pattern deep plate. Measures 9 1/8" across and sits 1 1/2" high. There is only very light wear to the high points of the fruit. No chips, cracks or repairs. 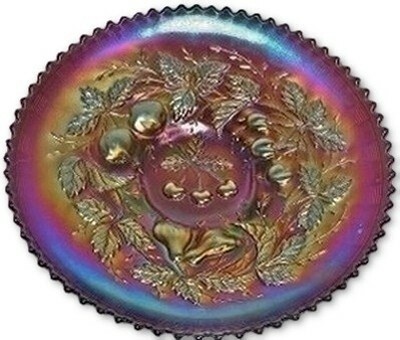 Purple stippled THREE FRUITS with wide rib back pattern deep plate. 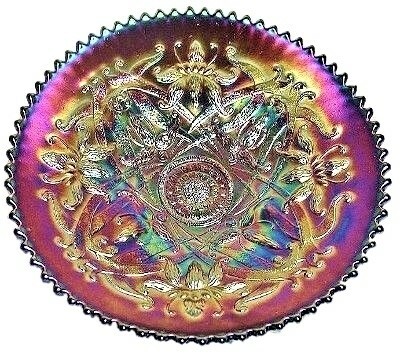 Measures 9" across and sits 1 1/2" high. There is only minimal wear to the high points of the fruit. No chips, cracks or repairs. 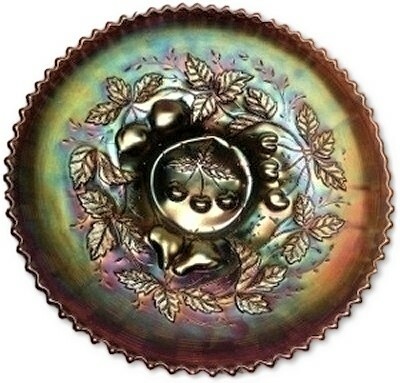 Purple stippled THREE FRUITS with wide rib back pattern deep plate. Measures 9" across and sits 1 1/2" high. There is some moderate wear to the high points of the fruit. No chips, cracks or repairs. 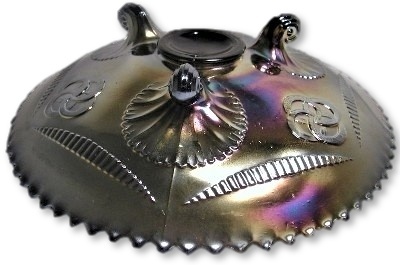 Purple Three Fruits Medallion spatula footed bowl with Meander back pattern. Measures 8 3/4" across and stands 3 1/2" tall. No chips, cracks or repairs. 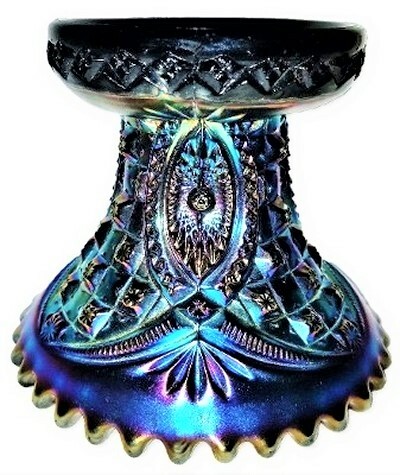 Dark amethyst/purple standard stubby TREE TRUNK vase. 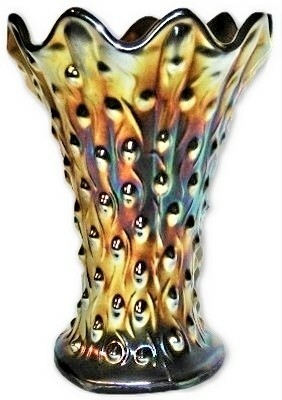 A very crisp non swung vase which boarders on being electric. Stands only 6 1/2" X 3 1/4" across the base and 5" across the top. Marked with Northwood's underlined capital N in a circle on a plain base. 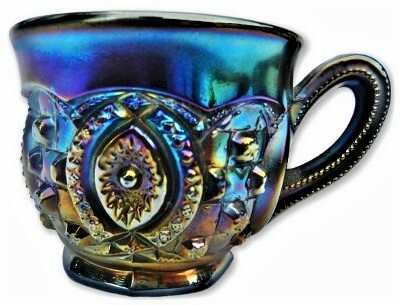 There is a small amount of manufacturing base lack of iridescent color over the very dark purple glass. No chips, cracks or repairs. 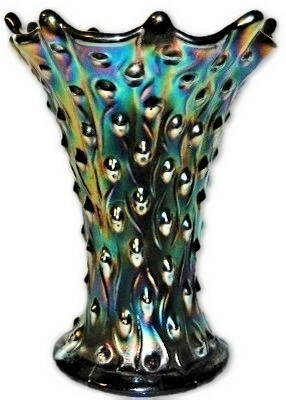 Dark amethyst/purple standard stubby TREE TRUNK vase. 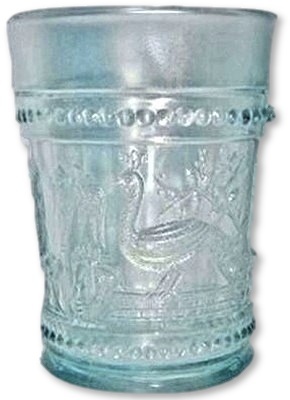 A very crisp non swung vase. Stands only 6 7/8" X 3 1/2" across the base and 4 3/4" across the top. 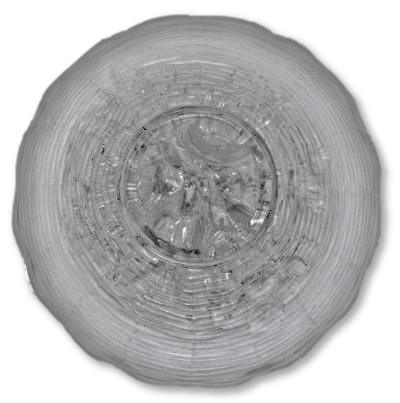 There is a small amount of manufacturing base distortion and seam roughness on the underside. No chips, cracks or repairs. 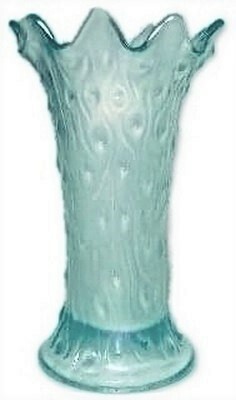 Ice blue rare standard stubby TREE TRUNK vase. This item is faintly marked inside with NORTHWOOD'S underlined capital N in a circle. 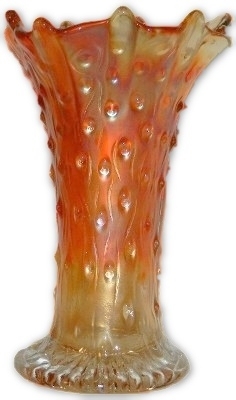 A very crisp non swung vase with great mold impression. 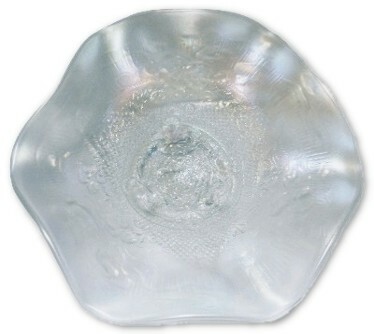 The points of the top rim measure between 7" up to 7 1/4". 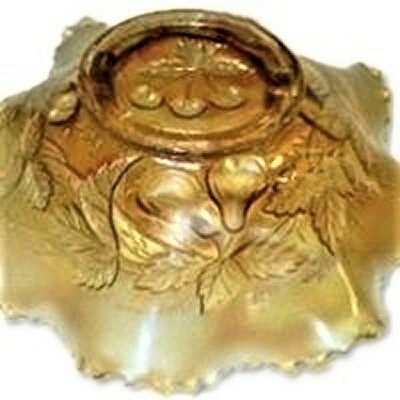 The base measures 3 1/2" across. There are some closed interior bubbles. No chips, cracks or repairs. 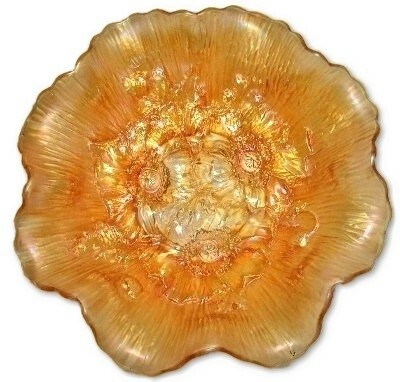 Brilliant marigold standard "stubby" TREE TRUNK vase. 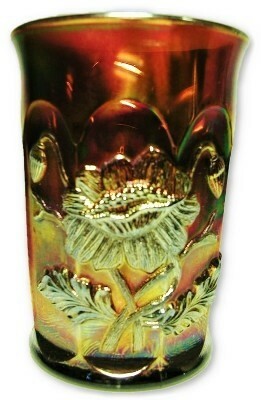 A very crisp non swung vase. 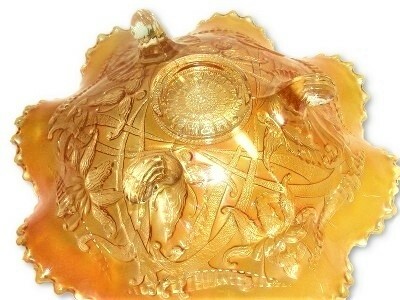 Stands only 7" X 3 3/4" across the star base and 5" across the top. No chips, cracks or repairs. 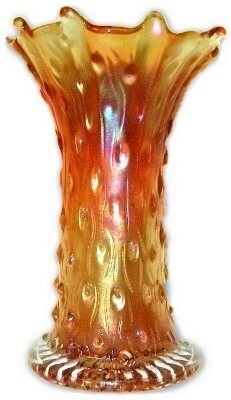 Brilliant marigold standard "stubby" TREE TRUNK vase. 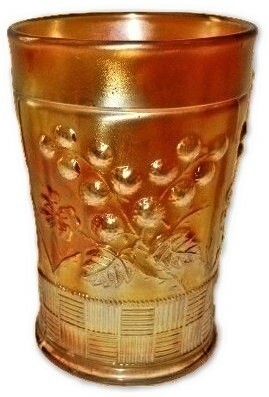 A very crisp non swung vase. Stands only 7 3/8" X 3 3/4" across the star base and 5" across the top. No chips, cracks or repairs. 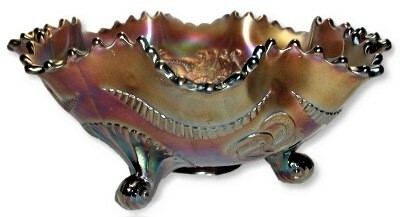 Fiery amethyst Wishbone with Ruffles and Rings 3 footed ruffled bowl. Measuring 8 1/4" across and standing 3 1/8" high. No chips, cracks or repairs. Fiery amethyst Wishbone with Ruffles and Rings 3 footed ruffled bowl. Measuring 7 3/4" across and standing 3 1/2" high. No chips, cracks or repairs. Amethyst Wishbone with Ruffles and Rings 3 footed ruffled bowl. Measuring 8 1/2" across and standing 2 3/4" high. A number of manufacturing straw marks front and back. No chips, cracks or repairs. 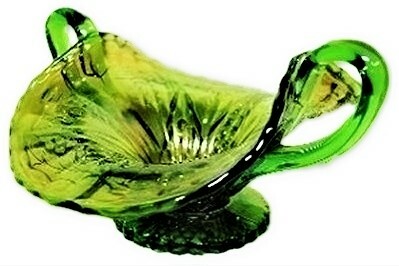 Apple green 3 footed Wishbone with Ruffles and Rings ruffled bowl. Measuring 8 1/4" across and sitting 3" high on 3 beautiful scroll feet. No chips, cracks or repairs. 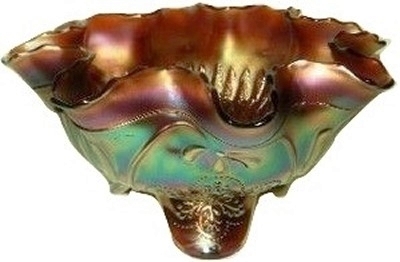 Pastel Marigold Wishbone with Ruffles and Rings back pattern 3 ball footed ruffled bowl. Measures 8" X 3". Marked with Northwood's underlined capital N in a circle. No chips, cracks or repairs. 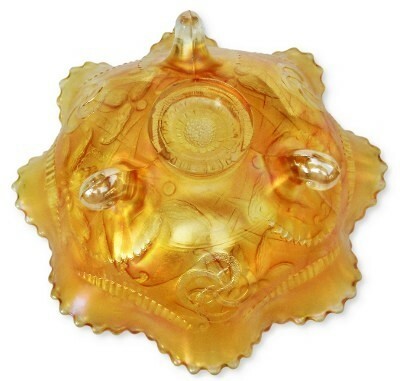 Marigold Wishbone with Ruffles and Rings back pattern 3 ball footed ruffled bowl. Measures 8 1/4" X 2 3/4". Marked with Northwood's underlined capital N in a circle. No chips, cracks or repairs. 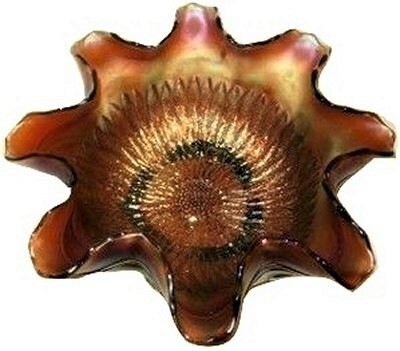 Dark Marigold Wishbone with Ruffles and Rings back pattern 3 ball footed ruffled bowl. Measures 8 1/4" X 2 3/4". Marked with Northwood's underlined capital N in a circle. No chips, cracks or repairs. Horehound root beer WISHBONE with Ruffles and Rings 3 footed ruffled bowl. Marked with Northwood's underlined capital N in a circle. Measures 8 1/4" X 2 1/2". No chips, cracks or repairs. Brilliant amethyst Wishbone with Ruffles and Rings back pattern 3 scroll footed plate! Measuring 8 3/4" X 1 3/4" No chips, cracks or repairs.